Richmond, Virginia (CNN) - Former South Carolina Gov. 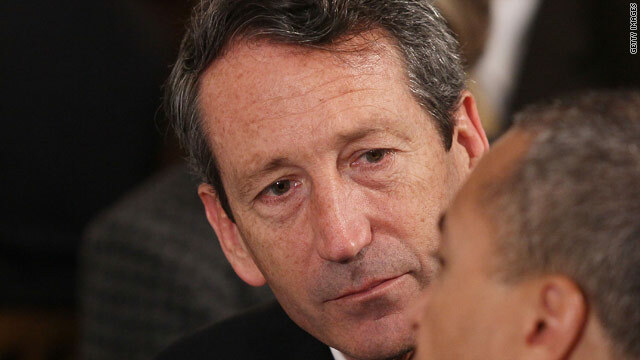 Mark Sanford is launching a political comeback that may begin within days. Sanford is planning to run for the Congressional seat he held almost a decade ago, a Republican source familiar with his thinking told CNN late Thursday. “He’s looking all but certain to do it,” said a former top aide to Sanford, who did not want to be identified while prematurely revealing the plans. A formal announcement will come soon, the source said. Sanford intends to seek the Republican nomination in South Carolina’s 1st Congressional District, a seat being vacated by Rep. Tim Scott, who was appointed to the United States Senate earlier this week by Gov. Nikki Haley. Sanford’s first test, the Republican primary, is likely to happen in late March. Under South Carolina law, the primary must take place 11 weeks after Scott officially resigns his House seat. He is expected to do so in early January. A runoff election would take place two weeks after the primary, if no candidate receives a majority of votes, followed by a special election in May, a contest that will strongly favor the Republican nominee given the district’s GOP-friendly map. Sanford, who resides in the Charleston area, represented the coastal district from 1995 to 2001 and had a conservative, almost libertarian voting record, often taking lonely stands on the House floor alongside Rep. Ron Paul of Texas. After his three terms in the House, he ran successfully for governor twice and was eyeing a 2012 presidential bid before he notoriously embarked on an extramarital affair that derailed his national ambitions. He is now engaged to his Argentine fiancee. Given the sprint-like nature of the special election, Sanford would immediately begin his campaign as a frontrunner for the GOP nomination. He has greater name recognition than any of his potential rivals, and he still has $124,000 remaining in his congressional campaign account, giving him an immediate financial advantage. Sanford has been considering a comeback since leaving office, and his timeline accelerated earlier this month when Sen. Jim DeMint announced that he was resigning to run the conservative Heritage Foundation. That opened the door to Scott’s elevation to the Senate and left a sudden vacancy in the House, offering Sanford his clearest road back into politics. The Capitol Hill newspaper Roll Call reported on Monday that Sanford was “studying” a run for his former House seat. But two other Republicans exploring a bid for the same seat were complicating his path forward. His ex-wife, Jenny, a resident of Sullivan’s Island, South Carolina, has been courted to run for office for years and was on Haley’s shortlist to replace DeMint in the Senate. She told several media outlets this week that she was open to the idea of running for Scott’s House seat. But Mark Sanford’s apparent decision to run for Congress is a strong signal that Jenny Sanford will not: He has made clear to confidantes in recent days that he would not embark on a campaign that pitted him against his ex-wife. Sanford’s former chief-of-staff Tom Davis, now a state legislator, has also been mentioned as a possible candidate, but sources say he is also unlikely to run. Almost a dozen Republicans have made noise about running for the seat, with two figures - state Sen. Larry Grooms and state Rep. Chip Limehouse - emerging as top-tier candidates alongside Sanford. He is, after all, a family values man, right? Would like to think this is a joke. Except it is not funny. Has this creature no shame? Of course not. He is a politician. Everyone knows he is a loser and the voters will affirm that!!! !